Why happiness is not a pursuit but a way of life. Indeed, human’s greatest desire is happiness. We’ll do anything, go to any length, confront any obstacle, in the pursuit of happiness. Yet, happiness is not a pursuit, as such. It is a way of life. Throughout the centuries, history’s greatest thinkers have suggested: Happiness is found in helping others. I’ll skip the idea of “helping others” in this story and instead tell the story of connecting and forming community, a way of life that produces the UN ideal of helping in the fulness of life. This is first-hand account by the people in the story, but I have three objectives in my presentation of the story. One, (and on the light side), March 20, the International Day of Happiness, also falls in the zodiac sign of Pisces, and although I am not an observer of the zodiac, I am nevertheless, curious about positive and reasonable correlates, whatever their source turns out to be. Pisces, for example, (February 19 –March 20) embodies compassion, intuition, gentleness, wisdom, trust and creativity. These are some of the positive qualities the people in this story exhibit, even if they are not (and I am certainly not) in the cycle. Two, do we go about doing what we do, and enjoy, because of some expected return? This story demonstrates that “return”, even as important as happiness, is not as much a sought-after goal as an outcome. Three, this is the season of Lent when we reflect on, along with other callings, self-sacrifice. Maundy Thursday, the anniversary of the core of this story, commemorates Jesus washing his disciples’ feet to highlight his call on his followers to selfless giving to others. “Ordinary people doing extraordinary things” highlights everyday life of ordinary folks finding meaning, purpose and happiness just being who they are. It all began one early cold morning in 2009. Rob interrupted his morning run with his dog Joey to “investigate” police presence on the grounds of Capitol Hill United Methodist Church. The investigation revealed a couple of things. One, there were folks in need of a resting space at night and Capitol Hill United Methodist Church was that resting space. Second, as a new day began, many other people needed access into the church too. These needs would have to co-exist, something that was not happening that morning. As Rob related to me, “We decided to do something”. And who are we? I enquired. Instead of the police being involved, Rob, Dave Sam and other volunteers would come by in the morning and wake up the folks before the church opened for daily functions. Before long, the wake-up calls became moments for conversation and connection. One day Pastor Alisa, the lead pastor, had an event when she invited to the church, folks from North Carolina who had gone to work in an orphanage in Brazil, along with some from the orphanage. She also invited the folks who slept on the church premises to the event. A community was beginning to take shape. Wake-up calls soon became also, opportunity to freshen up. Why not? Rob thought. It would take only a couple of minutes to make a pot of hot coffee. It soon was routine for Rob, Dave and Sam to not just wake up guests and open up the rest rooms at 7:30, but also make coffee and connect with these new friends. In a month, April 18, 2019 we’ll observe Holy Thursday, or Maundy Thursday. That will also be the 10th anniversary of what has become Our Daily Bread. On that day, 10 years ago, Lester, a regular coffee guest but did not sleep outside the church, donated six bags of cereal. From then on volunteers from the church started making donations and breakfast of coffee, donuts and cereal was served at 7:30, Mondays through Fridays. With initial core volunteers of Dave and Barbara, Sam and Sue, and Rob, Pastor Alisa and the clergy, Our Daily Bread has grown into a vital ministry of Capital Hill United Methodist Church, connecting a diverse congregation. Today, Our Daily Bread is a lot more than coffee and cereal. It is more than an opportunity for Capitol Hill homeless neighbors to freshen up for a new day. The story of Our Daily Bread is full of inspiration from any perspective you look at it. The first question in my mind as I spoke to different people for this story revolved around plans. What plans, goals and expectations did anyone have? The answer is: None whatsoever. There was an opportunity to serve a person in need and developments came along the way. Today, you can say, there is still no fixed plan or expectation. God provides from God’s abundance. After the Washington Post published a Christmas story, featuring Our Daily Bread, more people heard of what was happening, more donations started coming in, more volunteers started serving and picking up donations. By December 2009, Our Daily Bread got a social worker through Capitol Hill Group Ministries. She began with once a week visits enrolling folks into housing programs. A year later, September 2010, and another major milestone. That is when Margot. came in and as Rob put it, “she kicked me out of the kitchen”. But, more than that, Margot. is the face of Our Daily Bread. Margot. was a volunteer with Community Supported Agriculture which provides fresh agricultural produce from Pennsylvania to members in Washington DC. As it happens, some supplies are not picked up. At that time, Margot. was praying for a break-through in the needs of the less fortunate in DC. Her friend, Lisi, who was a volunteer for Our Daily Bread suggested that she donate whatever was not picked up to Our Daily Bread. Margot has not only found the ministry of her prayers, she is, de facto coordinator of Our Daily Bread. Along with Rob they are full time volunteers Mondays through Fridays. Most of the original founding volunteers are still going strong ten years later. Dave and Barbara moved on, after seven years, to a new ministry supporting an orphanage in Zambia. Their Monday slot is now headed by Jane with enthusiastic help from Linda and Ricky. Jane is a lot more than Monday’s lead volunteer. She too is, in many ways, a full-time volunteer. She connects Our Daily Bread with area stores and food markets for supplies. Today, Our Daily Bread is also a partnership between Capitol Hill United Methodist Church and other area churches: St. Mark’s Episcopal Church on Capitol Hill and Christ Episcopal Church provide casseroles, and Nancy, a member of Christ Episcopal is the lead volunteer on Thursdays. Other partner churches are Capitol Hill Presbyterian Church which provides breakfast burritos and St. Peter’s Catholic Church which donates donuts and sandwiches leftover from events. 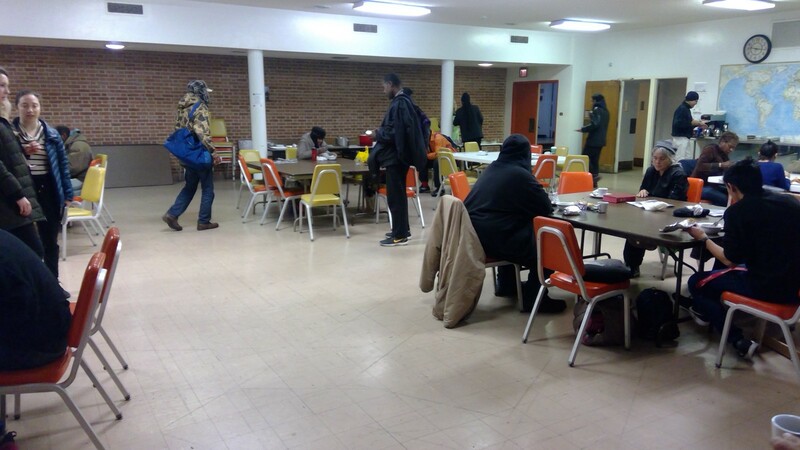 With breakfast served each weekday, the next move was to find healthcare for the guests. Luckily, Unity Healthcare has been a resource in DC for people of low income or experiencing homelessness. They began providing services twice a month on their Mobile Clinic. Now they have outreach every Thursday morning. There are also other outreach workers on Tuesdays and Thursdays helping folks obtain basic documents like birth certificates, IDs and Social Security cards. In addition to Capitol Hill Group Ministries, there are case managers coming from Community Connections, Miriam’s Kitchen, Pathways to Housing and MBI, one of the Mental Health clinics. Our Daily Bread is, in turn, a referral for recovery programs for those struggling with addictions. Spiritual well-being is, of course, an important facet of Our Daily Bread. Every Wednesday morning, after breakfast, there is time for bible study led by one of the parish pastors. As Rob stresses, “it is not just food. It is about God working in lives through friendships, fellowship and forming community”. The beginning was unplanned except for responding to human need. Throughout, the inherent idea is breaking down walls and barriers between people. Nevertheless, there have also been very positive and encouraging outcomes. It has been transformative for everyone; guests, volunteers and the parish as a whole. Some who were experiencing homelessness have moved into housing. Others struggling with addictions have found sobriety and recovery. Some have died too, and the church has had funerals for them too. As members of the community, some from Our Daily Bread have been elected to various leadership positions within the congregation. Pastor Alisa encouraged me to talk to Shine. This is his testimony: “If you knew me then, and now you see me, you wouldn’t believe”. Shine was one individual with particularly rough edges. At one point it was necessary to bar him from the church (imagine that). Today, he works with Rob. One particularly inspiring aspect of forming community was the idea of communal living. Back in 2010 Rob invited four Our Daily Bread guests to share a one-bedroom apartment with him. Those four have since moved on, but the arrangement still goes on, with four breakfast guests and Nathan, an. intern, sharing accommodation with Rob. Unfortunately, the same idea for a women’s living arrangement did not achieve the same level of success. That highlights the fact that the people in this story are ordinary humans who experience the same obstacles and struggles we all face. Think of this community not only in local terms. Yes, there are 45–50 volunteers every week. There are also more than 700 each year who come from as far away as Myanmar, Italy and the Republic of Georgia, representing schools, churches, youth and student groups. That is the extent and scope of the fellowship and community. And now, a confession. I am not reporting a story that has been narrated to me. For a little over a year now, I too have been a volunteer on Mondays with the wonderful team of Jane, Linda and Ricky. And, of course, I know first-hand the individuals in this story. Their story is my story. We always look forward to Monday morning. Every day is International Day of Happiness and every day is like Maundy Thursday. Originally published at joelmlayblog.wordpress.com on March 19, 2019. Author of Paths as yet Untrodden www.amazon.com/author/joelmlay and blogger at https://joelmlayblog.wordpress.com.